Oncogene 2014 33(22), 2846-56. GSK690693 purchased from Selleck. Western blotting demonstrated that ART3 expression did not exhibit a significant change in MDA-MB-231 cells treated either p-AKT inhibitor (GSK690693) or p-ERK inhibitor (AZD6244). Oncotarget, 2016, 7(29):46589-46602. GSK690693 purchased from Selleck. IKBKE-transfected or insulin-simulated H1299 cells were treated with indicated Akt inhibitors (e.g. perifosine 5 uM, MK2206 10 uM, and GSK690693 10 uM), following transfection of PDK1-null and parental HCT116 cells with HA-Akt, wild-type and constitutively active IKBKE, Western blot analysis was performed. J Biol Chem 2011 286(43), 37389-98. GSK690693 purchased from Selleck. Cell growth of sensitive (DLD1 and U87) and multi-drug resistant (DLD1-TxR and U87-TxR) cells assessed after 72 h of GSK690693 treatment. GSK690693 efficacy decreased in DLD1-TxR in comparison to its sensitive counterpart - DLD1. Colorectal carcinoma cell line (DLD1) possesses mutated p53, while its resistant counterpart (DLD1-TxR) additionally acquired the LOH in PTEN gene during the course of resistance induction. However, concentration-dependent cell growth inhibition induced by GSK690693 does not differ between sensitive (U87) and resistant (U87-TxR) glioblastoma cell lines. Both, U87 and U87-TxR have wt-p53 and PTEN-null. The results were obtained by the Sulforhodamine B assay. All values represent average ±SD obtained from two independent experiments, n = 5. Dr. Milica Pesic of Institute for Biological Research. GSK690693 purchased from Selleck. The effects of SelleckChem inhibitors on sea urchin embryo development evaluated 24 h after fertilization. All compounds were added to embryos suspension 20 min after fertilization. The relative presence of late gastrula, swimming blastula, undeveloped embryos and dead embryos was compared next to untreated control embryos (A). Fertilized egg, swimming blastula and late gastrula are illustrated (B). The embryonic development was relatively synchronized in untreated control samples after 24 h (A, E). GSK690693 treatment sustained the development of embryos. Swimming blastulas kept normal motility regardless the deformities in their shape. Tipifarnib treatment induced significant toxicity due to occurrence of dead fragmented embryos. Some abnormal blastulas kept the motility. AZD2014 treatment sustained the development of embryos. Some developed gastrulas and blastulas were less motile in comparison with control (A, C). WZ811 was the least toxic compound. Significant number of gastrulas and blastulas was developed. However, their motility was considerably suppressed (A, D). In contrast to SelleckChem inhibitors, classic anticancer agent-cisplatin was extremely toxic to sea urchin embryos (A). Cisplatin killed many embryos, while a small amount of survived embryos was stopped at early phases of development: immediately after fertilization or after first and second division (A, F). Dr. Milica Pesic from Institute for Biological Research. GSK690693 purchased from Selleck. His-tagged full-length Akt1, 2, or 3 are expressed and purified from baculovirus. Activation is carried out with purified PDK1 to phosphorylate Thr308 and purified MK2 to phosphorylate Ser473. To more accurately measure time-dependent inhibition of Akt, activated Akt enzymes are incubated with GSK690693 at various concentrations at room temperature for 30 minutes before the reaction is initiated with the addition of substrate. Final reaction contains 5 nM to 15 nM Akt1, 2, and 3 enzymes; 2 μM ATP; 0.15 μCi/μL[γ-33P]ATP; 1 μM Peptide (Biotin-aminohexanoicacid-ARKR-ERAYSFGHHA-amide); 10 mM MgCl2; 25 mM MOPS (pH 7.5); 1 mM DTT; 1 mM CHAPS; and 50 mM KCl. The reactions are incubated at room temperature for 45 minutes, followed by termination with Leadseeker beads in PBS containing EDTA (final concentration, 2 mg/mL beads and 75 mM EDTA). The plates are then sealed, the beads are allowed to settle for at least 5 hours, and product formation is quantitated using a Viewlux Imager. Cell lines: T47D, ZR-75-1, BT474, HCC1954, MDA-MB-453, LNCaP, etc. Method: Cells are plated at densities that allow untreated cells to grow logarithmically during the course of a 3-day assay. Briefly, cells are plated in 96- or 384-well plates and incubated overnight. Cells are then treated with GSK690693 (ranging from 30 μM-1.5 nM) and incubated for 72 hours. Cell proliferation is measured using the CellTiter Glo reagent. Data are analyzed using the XLFit curve-fitting tool for Microsoft Excel. IC50 values are obtained by fitting data to Eq, 2. Rhodes N, et al. Cancer Res, 2008, 68(7), 2366-2374. Levy DS, et al. Blood, 2009, 113(8), 1723-1729. Altomare DA, et al. Clin Cancer Res, 2010, 16(2), 486-496. Why pAKT increased after treatment of the inhibitor ? GSK690693 actually inhibits AKT, but not necessarily decrease p-Akt level. Treatment with GSK690693 caused AKT hyper phosphorylation which has already been reported in some papers. (For example, http://www.bloodjournal.org/content/113/8/1723.short?sso-checked=true). To test the inhibition of AKT activity, you might have to look at the level of AKT substrates. Ipatasertib (GDC-0068) : Phase II for Prostate Cancer and Gastric Cancer. SC79 is a brain-penetrable Akt phosphorylation activator and an inhibitor of Akt-PH domain translocation. 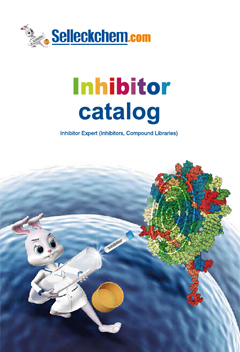 Features:Moderate preclinical tolerability, and PD characteristics of an AKT inhibitor. 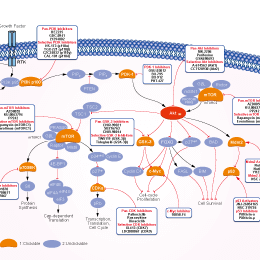 Distinct profile from other AKT inhibitors in clinical development. Features:Orally bioavailable compound (achieved by replacing indole of A-443654 with phenyl moiety) and somewhat less selective for Akt over PKA than A-443654.